The president of Spain’s Catalonia region said yesterday (21 September) he would formally call “in the next days” for a vote on independence from Spain which has been scheduled for 9 November. The Catalan parliament passed a law on Friday enabling regional head Artur Mas to call such a vote, though the Spanish government has said it would violate the Spanish constitution and has pledged to block it in the courts. “The law […] will be used this week, in the next days, to call for the 9 November vote,” Mas said at an event in the Catalan city of Cardona. His remarks were broadcast by Spain’s state-owned television. With its own language and culture, and a longstanding pro-independence movement that has gathered momentum during the economic crisis, Catalonia has sought a referendum on independence similar to the one held in Scotland on Thursday. Alicia Sánchez-Camacho, leader of the centre-right Partido Popular (PP) in Catalonia, reacted to the statements, which she called “unacceptable”. She said that issues should be solved according to the Spanish constitution, and not through an “unconstitutional” referendum that could “divide” Spain. Pedro Sánchez, the leader of the Spanish Socialist Party PSOE, also accused Mas of fomenting dicisions between Catalans, because a referendum would make them decide being Calalans or Spaniards. “It’s foolish to have leaders who force us to choose between being Catalan and Spanish. We want to be Catalans and want to be Spaniards. No leader has the right to cause such division”, he stated. He also said that the case of Catalonia and Scotland were not comparable, because in the British democracy no one would dare to call a referendum illegal. Sánchez called on Spanish Prime Minister, Mariano Rajoy, “take the bull by the horns” and provide answers to Catalonia’s situation. Last April, the Spanish parliament rejected the proposal for a referendum in Catalonia, but Mas said it would be carried out anyway. When Spain returned to democracy in the mid-1970s, regions such as Catalonia and the Basque Country saw a vibrant resurgence of their culture and languages that had been crushed during the dictatorship of Francisco Franco. Catalans speak a language similar to, but distinct from, the Castillian Spanish spoken in the rest of Spain. The region accounts for 15% of Spain's population but 20% of its economy. With Spain's economy in freefall from the euro zone debt crisis, Catalans complain of paying billions of euros more in taxes than they receive back from Madrid. EURACTIV Poland: Po Szkocji czas na Kataloni? EURACTIV Greece: ??????????? «??? ???????? ???? ?» ????? ? ?????? ??? ?????????? 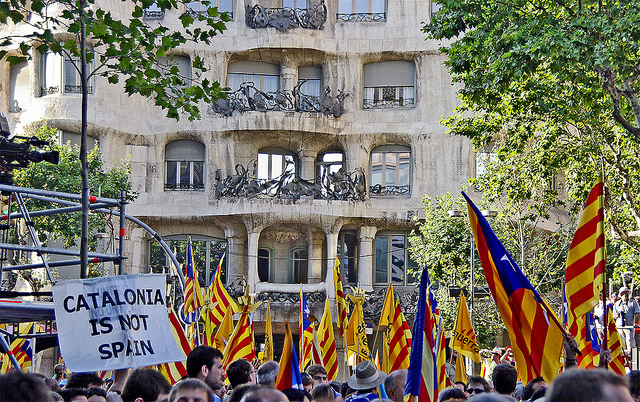 Catalunya is one of the 17 regions existing in Spain under its constitution . And if Catalunya wants take the bull by horns then they have no chance to defeat it unless the bull decide tonot to fight or to surrender. Pro-independence parties have been campaigning for years using schools, funding the media and altering the History to support their political aspirations. Since then, catalans have been raised to believe in those lies. Hence so many supporting independence. This is an unfair game full of corruption and victimism. Spain has a constitution, Mas knew it when he took office.